I know that I promised that I would write in this journal every month but the thing is, nothing special really happened in February. Therefore, I decided to post only one journal entry for both February and March. Don’t worry, I have some exciting updates! Random question – have I ever told you the Bali sunsets are the best? 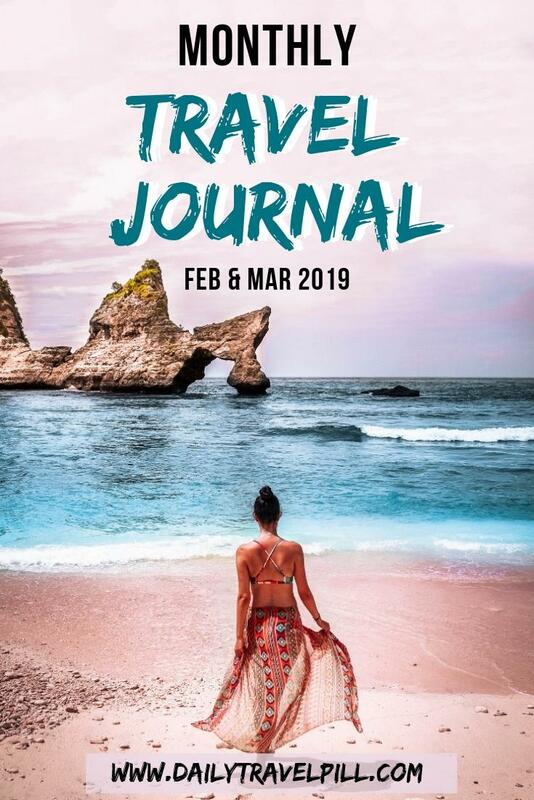 I’ve spent these two months in Bali and I was lucky enough to experience one of the most unusual celebrations, called Nyepi or the Day of Silence. For one day, each year, everything on this island is closed, including the international airport and nobody is allowed to leave their home. The Day of Silence is actually the Balinese New Year but let’s rewind a bit. One day prior to Nyepi people gather in a celebration called ogoh-ogoh. Men and boys carry giant creature figures on the streets. These figures are meant to scare all the bad spirits on the island. In the evening, when the ogoh-ogoh celebration starts, people gather on the streets and they march on the sound of gamelan music. It was a very interesting experience for me and it really made me feel like a part of the local community. The day after the ogoh-ogoh is the Day of Silence. Since all the restaurants, supermarkets and stores are closed and nobody is allowed to leave their home, we had to buy some food supplies the day before. During Nyepi we stayed inside and watched movies all day long. It was pretty relaxing and I have to say that I think every country needs its own Nyepi at least once a year. 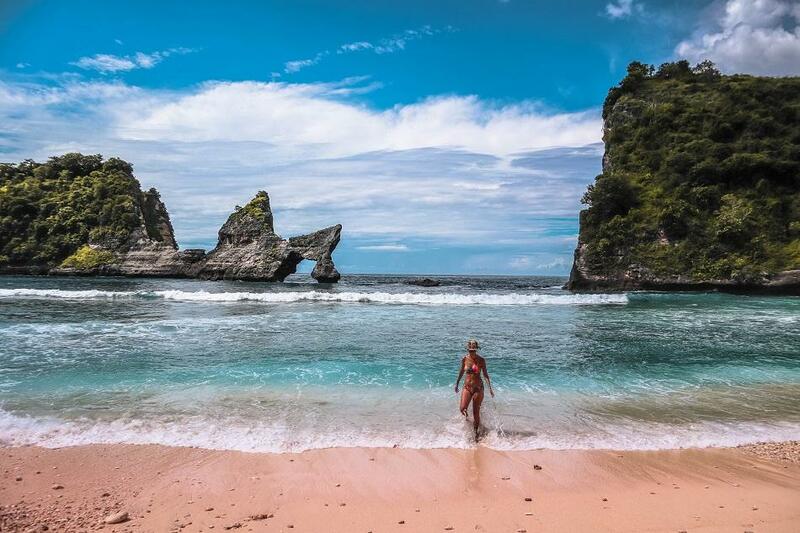 After about 6 months in Bali, we finally managed to visit Nusa Penida in March. We took the fast boat for about half an hour and we arrived on this beautiful island with crystal clear water and thousands of palm trees. On our first day we went to the Crystal Bay Beach which quickly became our favorite beach on the island. The beach was not too crowded and the water was perfect for swimming. Plus, the views were incredible! On our second day, we decided to visit the famous Diamond Beach, Atuh Beach and Tree House. We woke up at 6 am, hopped on our scooter and headed to the eastern part of the island. We were the first ones at the Diamond Beach so we took our time to shoot some incredible shots. After climbing down a few hundred stairs, carved directly into the rock, we got to a small wooden shop and a swing faced towards the ocean. We wanted to take some pictures right on the Diamond Beach but unfortunately the waves were too big so we bought a Coca Cola to get the energy to climb back all those stairs. Right near the Diamond Beach is the Atuh Beach. We had to climb down another set of stairs to get to it but the effort was well worth it. For just $3 we rented a sunbed and enjoyed the view towards the broken rock in the middle of the ocean. While we were admiring the views, a storm took us by surprise. Luckily, we were staying under a huge umbrella. After the rain stopped, we made our way to the famous Tree House but right after we took a few photos, it started to rain again. Since we had our backpack full of gear with us, Dan had to run to our scooter where we had a few plastic bags and I slowly made my way back through pouring rain. We were about 20 kilometers away from our accommodation and the rain didn’t seem to stop so we decided to just go back home and face the weather. On our third day on Nusa Penida we decided that we want to climb some more stairs (I’m being ironic) so we visited the beautiful Peguyangan Waterfall which is situated at the base of a 500 meter-tall cliff. When we visited, there was a local celebration right at the temple from the base of the cliff. Because of this, there were tens of locals carrying offerings down the steep stairs. I have to say that the climb back up was one of the most challenging things I have ever done but the views were worth it. Nusa Penida is well know for its terrible roads but nothing could have prepared us for the road to the Tembeling Natural Pool. The road was so bad that after about one kilometer we gave up and headed back to the main road where we continued our journey to the Banah Cliff Point. 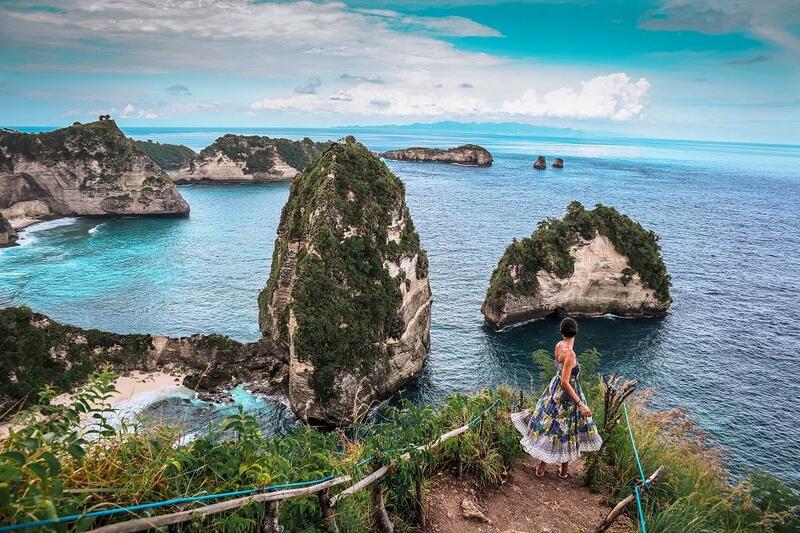 Our last day of exploring Nusa Penida was dedicated to two of the most important tourist attractions on the island – T-Rex Bay and the Broken Beach. I have to say that even though the T-Rex Bay is probably the most visited place on the island, there are other places such as the Diamond Beach which in my opinion are more beautiful. After a day full of sightseeing, we headed to our favorite beach, Crystal Bay Beach for a relaxing evening. Well, our evening turned out to be anything but relaxing. Shortly after arriving at the beach we ran straight into the water to cool ourselves off but a huge wave came and the ocean decided to steal both our eyeglasses. I’m pretty much lost without my eyeglasses but with the help of a few kind locals, I’ve found mine. Unfortunately, Dan was not as lucky as me and his eyeglasses are now forever lost in the ocean. Lesson learned: never swim with your eyeglasses on! Nusa Penida is one of the most beautiful islands I have ever seen and I definitely recommend everyone to visit it! It’s such a raw, untouched, beautiful place that will steal your heart for sure! At the end of March, we left Bali for the Philippines. We’ll make plans on the go and see where this journey will take us! Starting with the end of March we will spend one entire month in the Philippines. This country has been on my bucket list for a looooong time and I’m so excited to finally explore it! After the Philippines we will be heading to Java, Indonesia for a few weeks and we will slowly make our way back to Bali. This is the plan right now but things can change so stay tuned to see where we’re headed! At the end of January, I had 32,000 page views on my blog. Now, my page views increased to a little over 50,000! This is absolutely CRAZY! If I learned something in the past year is that the secret behind any successful blog is SEO. The majority of my traffic comes from Google and I’m proud as hell about that! It took me about one year to learn what SEO actually is and how it works but the results are incredible so far! I am sure that there is so much more to learn but I am happy with these results. If you want to learn more about SEO, make sure to check out Digital Nomad Wannabe. Sharon has great advice about how to grow a blog from scratch. I am really proud to announce that in February I’ve launched my latest preset collection called Deep Colors. These are the presets that I currently use on both my blog and Instagram. If you are a Lightroom newbie, you can try my desktop collection for FREE! I am super-proud about these presets as they work like magic on beach photos, nature landscapes and city photography! Make sure to check them out! Nothing changed about my relationship with Instagram. We’re still not best friends. I post from time to time but I don’t give it too much attention since my primary focus is my blog. Even though I promised to make more Youtube tutorials, I didn’t manage to do any these months but a new Youtube video is coming soon about my presets! You’re gonna hate me for this but I have to show you. I’ve discovered an amazing place here, in Changgu, called the Funky Pancakes. These are not just any pancakes. Yes they look fabulous but they are also DELICIOUS! If you’re ever in Canggu, Bali, don’t forget to check out this place. Totally recommend it! If you’re still reading this, you’re a hero! I am happy and grateful that you follow my journey and I hope to inspire you to travel to amazing destinations! That’s pretty much everything that happened in my life in February and March. See you in April! Imi place foarte mult sa iti citesc postarile si iti inteleg perfect relatia cu instagramul :)) enjoy Philippine! Hey! Multumesc tare mult! Of, da… Instagramul iti mananca nervii cateodata. Nu poti nici cu el, nici fara el!